Enter the date of the next occurrence of the transaction. If it's a recurring transaction, select the frequency in the drop-down menu below the calendar. Your transaction will now appear at the top of your register in gray. It will not yet affect your budget. 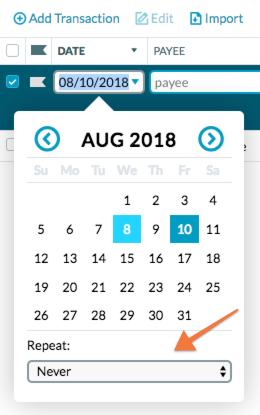 When the date of the next occurrence comes, the transaction will appear in bold in your register, waiting for you to approve it (we want to make sure it actually happened as planned!). Now, you'll be able to see upcoming scheduled transactions in your budget—with an orange alert if the category is underfunded. Go to Quick Start: What's Next?